Dual-SIM Android handset comes with 1.2 GHz dual-core processor. Samsung has launched the entry-level GALAXY S Duos 2 handset. This phone comes with a 4" WVGA PLS Display and runs the Android 4.2 Jelly Bean OS. It is powered by a dual-core 1.2 GHz processor. 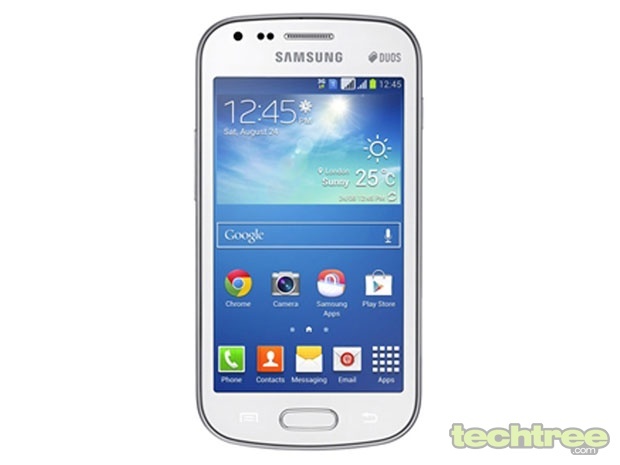 The Samsung GALAXY S Duos 2 is equipped with a 5 MP rear camera and a VGA front-facing camera. It has a battery capacity of 1500 mAh, and the dual-SIM handset also boasts of internal storage of 4 GB, and a microSD card slot for company. The Samsung GALAXY S Duos 2 is now available online for Rs. 10,790. The phone seems fairly underpowered for a handset priced over 10K. You get much better options at that price point; XOLO Q700i and Panasonic T11, to name a couple. Android 4.2 (Jelly Bean) OS. 5 MP rear camera with flash; VGA front camera.